People love traveling. It gives amazing experience of life and broaden your view. But humorists have not left this subject from being punched. 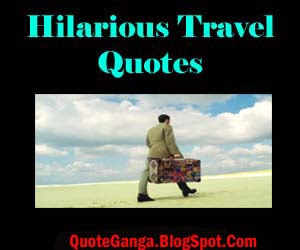 So here are hilarious travel quotes to enjoy. food, and design sensibilities that I discover all over the world can be found in every piece of my jewelry. and to offer such useful observations on the different productions as may occur. "Tourists -- have some fun with New york's hard-boiled cabbies. When you get to your destination, say to your driver, "Pay? I was hitchhiking."